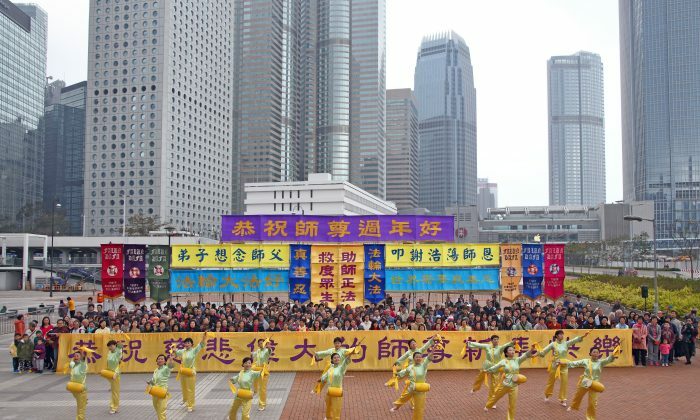 HONG KONG—Over 300 practitioners of the traditional spiritual discipline Falun Gong gathered outside Hong Kong City Hall on Feb. 19 to record their Chinese New Year greetings to the founder of Falun Gong, Mr. Li Hongzhi. Falun Gong practitioners around the world send electronic greeting cards each year to minghui.org, a Falun Gong website. In their greetings, they address Mr. Li as “Master,” a traditional title of respect for a teacher in China. The Hong Kong practitioners thanked Mr. Li and wished him a happy New Year. They also sang songs such as “Happy New Year Master,” “Hoping the Master Will Smile,” “Coming for you,” and “Falun Dafa Is Good” to express their endless gratitude to Mr. Li. Falun Gong, also known as Falun Dafa, is a profound self-cultivation practice that was introduced to the public by Mr. Li in 1992. The practice is guided by the universal principles of truthfulness, compassion, and forbearance, and based on the laws that underlie the development of the cosmos. Falun Gong spread widely by word of mouth and is now practiced in 114 countries and regions, bringing moral and health benefits to tens of millions of people. The Falun Dafa books have been translated into more than 30 languages, and thousands of proclamations and citations have been issued to Mr. Li and Falun Gong by governments and organizations around the world. On July 20, 1999, then-leader of the Chinese Communist Party (CCP) Jiang Zemin began a cruel persecution against Falun Gong practitioners out of personal jealousy and paranoia. The Minghui website has confirmed that more than 3,800 practitioners have been tortured to death. For more than 15 years, millions of Falun Gong practitioners in China and overseas have peacefully and rationally raised awareness of the persecution and have gained more and more international support. In recent years, Israel, Spain, Italy, Australia, Canada, the United States, and other countries have been calling for an end to the persecution and trying to stop the CCP’s illegal organ transplant activities through legislation. More than 50 high-ranking CCP officials, including Jiang Zemin, Luo Gan, Zhou Yongkang, and Bo Xilai, have been taken to court by Falun Gong practitioners in over 30 countries for genocide and crimes against humanity.